Pentagonal Building To Fit Perfectly into Any Corner. 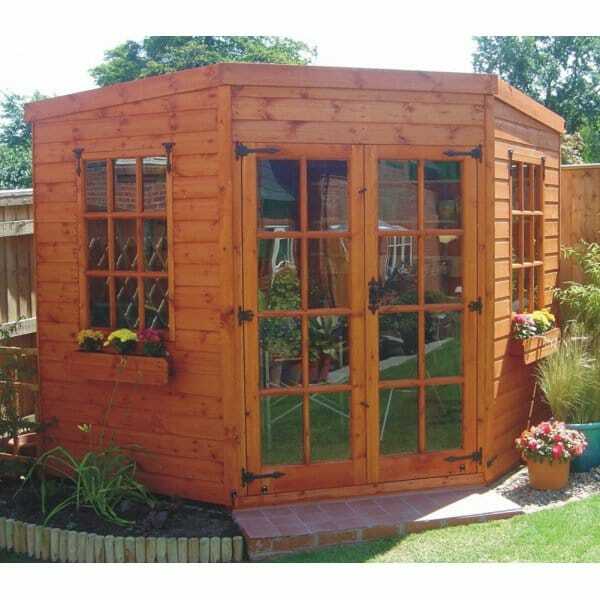 A1 Kirton Corner Summerhouse: 7 x 7 / 8 x8: The A1 Kirton Corner Summerhouse is a beautifully designed corner summerhouse that will suit anyone looking to optimise space in their garden. This building is pentagonal so it can fit into a left or right hand corner of your garden. The smooth T&G cladding provides a traditional look and the smooth timber will take any staining and treatments evenly. The glazing comes in two options so if you wish for a traditional look, the Georgian style glazing is idea and the square leaded glass offers a more contemporary look. The roof is covered with inclusive felt and slopes down to the back to allow rain water to run off with ease.